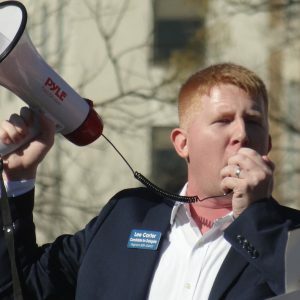 Georgia’s 7th congressional district– small towns and suburbs in Gwinnett and Forsyth counties northwest of Atlanta– is going to be an election hot house next year. It’s been a red district for a long time that’s turning purple. McCain won it with about 60% and so did Romney. Trump won it as well, but his margin was narrower: 51.1% to 44.8%. Then last year, Stacey Abrams won the district by just over 1,700 votes. A weaker Democratic congressional challenger, Carolyn Bourdeaux, did well too– but not well enough to win the seat. 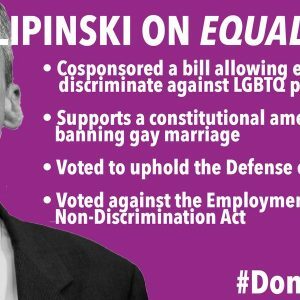 Well, enough, though, to scare the Republican incumbent out of the 2020 race. Rob Woodall announced he’s retiring at the end of the current term, creating an open seat. It’s now a top tier target for both parties. Carolyn Bourdeaux didn’t impress us as a candidate last time and we were really happy to see that there are 3 other Democrats in the primary besides her this cycle. 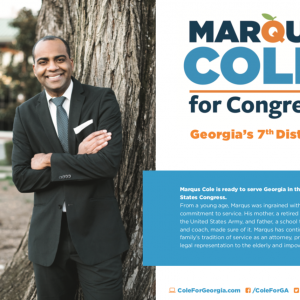 Marqus Cole is the progressive in the race. 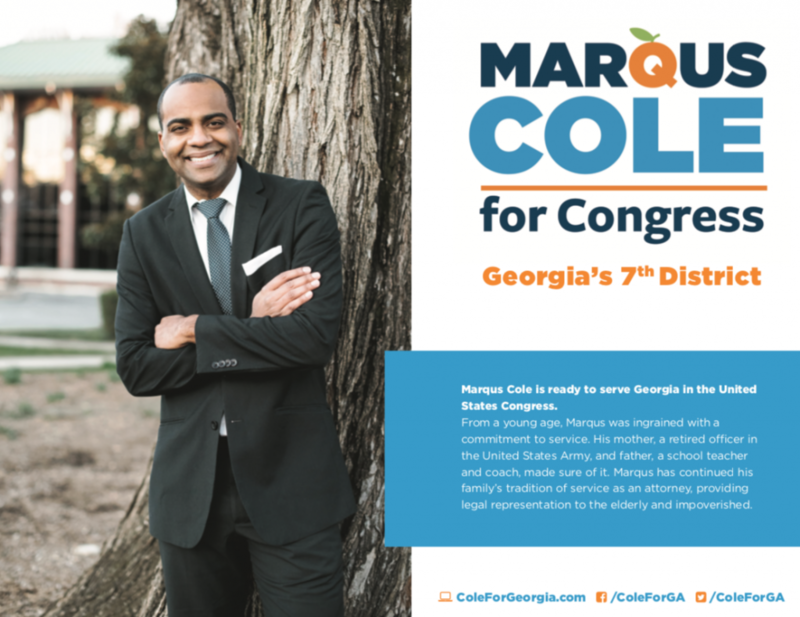 The other two are establishment candidates much like Bourdeaux– a wealthy Hillary Clinton fundraiser, Nabilah Islam, and John Eaves, a Fulton County Commissioner from another district, who ran for mayor of Atlanta last year (coming in 8th with 1.2% of the vote). When I spoke with Marqus the first political topics he brought up were voting rights, a fair tax code and healthcare. Short version of how he sees healthcare: he backs a similar approach to the one Bernie and Pramila have introduced– a much-improved single-payer system for all Americans, Medicare which fixes the high priced pharmaceuticals problem the GOP built into it with Part D and Medicare which includes care for teeth, ears and eyes. So not just “Medicare-For-All” as much as a new and improved Medicare-For-All. That said, I asked Marqus to introduce himself with a guest post explaining why basic democracy is so important for him in this campaign. 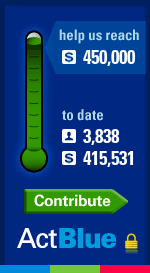 Please give it a careful read and if you like it– and I think you will– please consider contributing what you can to his campaign by clicking on the Blue America 2020 thermometer on the right. Chief Justice Roberts, I’m here to take you up on your challenge. It is time for Congress to remedy the problem of racial discrimination in voting rights. 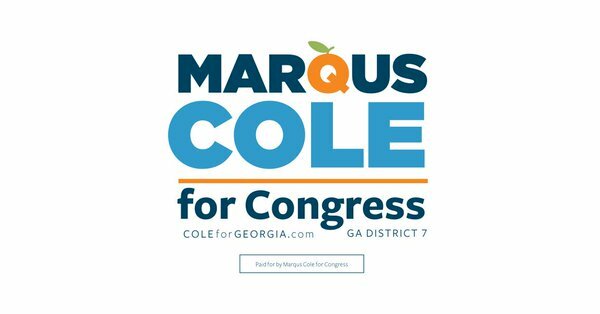 And as the U.S. Representative for the Georgia 7th Congressional District, I am going to fight to do just that. You want to talk about “current conditions,” Chief Justice Roberts? I can tell you about current voting conditions. People around the country, because of their race or income level, are facing barriers to exercising their Constitutionally protected right to vote. My forefathers were beaten, bullied, and bloodied to keep them away from the ballot box in the Jim Crow era south. My Grandfather and my wife’s Grandfather served the country in the Army to defend the principles and values of democracy abroad and returned to a country where their own votes were not protected. Our ancestors suffered and fought to protect voting rights. I will not sit idly by as the U.S. Supreme Court destroys our voting rights and Congress sits impotent, refusing to to do anything about it. When the John Roberts Court in Shelby County gutted the crown jewel of the Civil Rights Movement by finding section 4 of the Voting Rights Act unconstitutional, it simultaneously threw down a challenge for Congress: Ensure that new legislation is more appropriately responsive to “current conditions” or continue to let the voice of the people be suppressed. And to no one’s surprise, Congress has not acted. Voters in my community and across the country continue to be disenfranchised. It reminds me of that bloody Sunday in 1965 when my fraternity brother, Congressman John Lewis, stood as a symbol of the then “current conditions.” He stood in the face of incivility, injustice, and immorality, demanding rights at the cost of much blood and many tears. It was on that day that America watched its dark twisted soul bared and broadcast on national television. 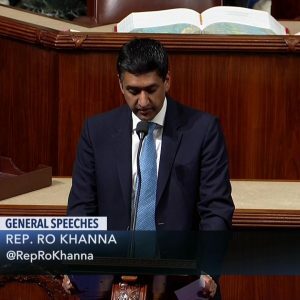 And it was in that context that the United States Congress found its conscience and its voice and united to pass the very same Voting Rights Act that Chief Justice Roberts summarily tossed aside as if it was yesterday’s news in Shelby County. What is our “current condition,” Chief Justice Roberts? 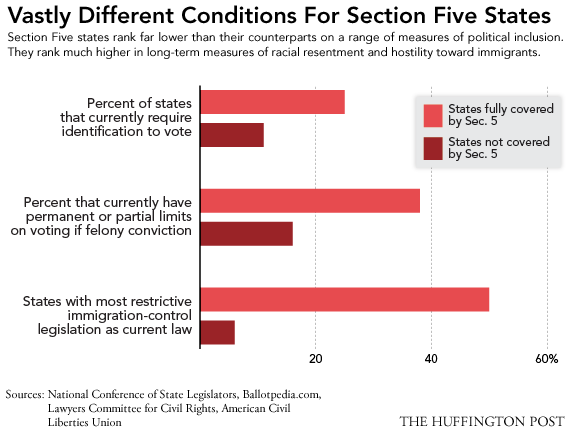 Our “current condition” is rife with voter fraud and discrimination. Our “current condition” is one where all too often marginalized minority voters find themselves in unreasonably long lines with unreliable voting machines. Our “current condition” is one where in some places you need more identification to cast your vote than to buy a gun. Our “current condition” is one where local officials reject, deny, and outright forge ballots of voters from communities of color. Our “current condition” is one where the elected official in charge of maintaining a fair election purged more than 500,000 voters in the year preceding his run for Governor of Georgia. The time is now. We must take up the baton of the great cause of the generations before. We must re-instill faith into the ballot booth. We must reinvigorate our calls for action. We must recommit to what was once a great shared value by all Americans: the VOTE is the bedrock of our government. It is this current condition that cries out for action now. I propose we take this opportunity to act boldly by passing the Voting Rights Advancement Act bill proposed by Congresswoman Terri Sewell. I propose we redouble our commitment to fully funding and staffing the Department of Justice’s Office of Civil Rights so they can pursue and prosecute bad faith actors. I propose that we provide real federal dollars to enhance and protect our ballot boxes and voting machines from unscrupulous actors and errant mistakes by ensuring every voter gets a paper receipt. And finally, I propose that we place the highest value on ensuring fair and free elections by enshrining our commitment to the opportunity to vote with a National Voting Day in November replacing Columbus Day as a federal holiday. Chief Justice Roberts, I’m here to solve the problem you created.